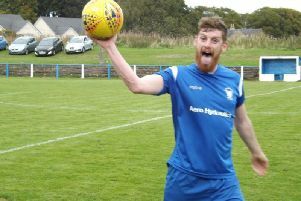 A freak goal by Glenafton goalkeeper Brian McGarrity condemned Lesmahagow Juniors to a 2-1 Ardagh Group West of Scotland Cup away defeat on Saturday. 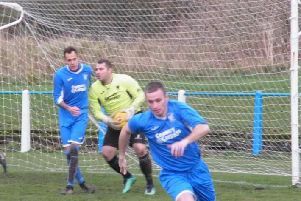 Lesmahagow produced one of their best performances of the season but came up just short against the Premiership side. The game was a tale of two very unusual goals,one for either side. 'Gow were first to show when Innes fired over then Matty Clarke had a great shot that was saved well by McGarrity. Glenafton were always a threat with McAndrew posing a few problems for the 'Gow defence. Lesmahagow took the lead on 44 minutes when Schoneville played a free-kick to Woodlock and when the little midfielder crossed the ball it deceived everyone and went into the net via the post. The lead lasted until the 56th minute when great work on the right by McAndrew saw him play in McCann who scored from close range. McStay then had a close range shot saved by McGarrity before Woodlock went close with a right foot shot. 'Gow then replaced Woodlock and Clarke with Thomson and Faughnan. The game was heading for penalties when Glens keeper McGarrity picked the ball up in his own box and fired a long kick upfield. It went beyond the 'Gow defence and Thomson was some 15 yards off his line. The ball took a massive bounce and went over him into the 'Gow net! But overall this was a good performance from 'Gow who now set themselves up for a league match at home to Thorniewood this Saturday.